You got an early night, got all your prep down pat and are up in the dark hours of the early morning to catch an epic sunrise ( If you missed our last post on how to photograph Sunrise make sure you catch up). 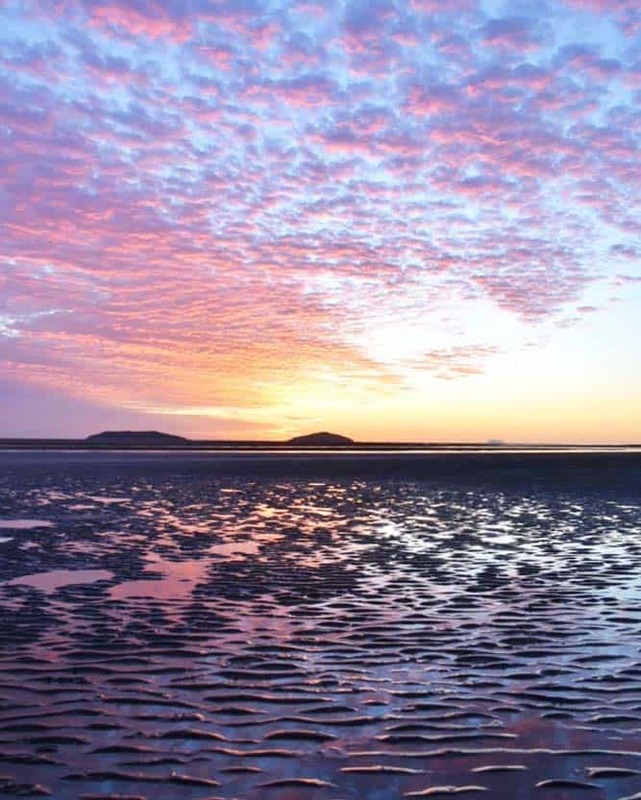 Now to the best photography tips and best camera settings for sunrise to catch that amazing golden image you will treasure long after your adventure is over. A couple of quick points to note before we go any further. 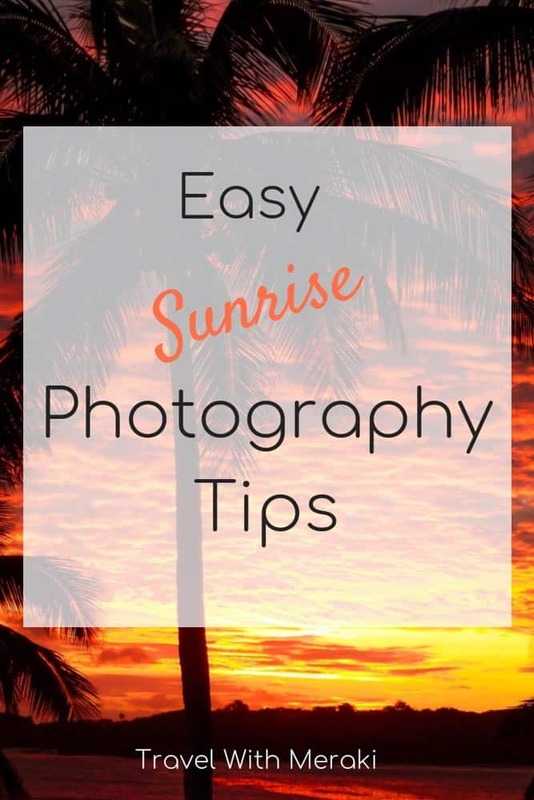 Although your preparation before may be slightly different, most of the photography tips in this post can be used for both sunrise and sunset photography. And an important word of caution…never look directly at the sun. Especially through a camera. Always use the live view function on your camera. You have made it to the perfect location to capture those magic rays of sunlight, got the tripod and camera all set up. Now what. This should be set on your lowest setting. On my camera, this is ISO 50 but this will depend on your camera. 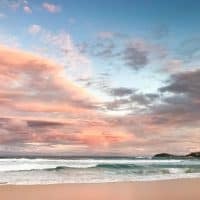 Which Mode Is Best For Sunrise Photography? There are a couple of modes you can use. Aperture Priority ( Unsure about how to change these on your camera? Watch a couple of YouTube clips on your camera make and model) or Manual. Aperture Priority will allow you to set the aperture and the camera will work out the Shutter Speed for you ( great if you are just getting started and it’s all a little daunting). Manual will allow you the freedom and creativity to create the best images. A mode that you should really not be using is Auto. If you are not brave enough to get out of Auto mode you are just lugging around an expensive point and shoot. It may take a while to learn how to use your camera but it will be worth it in the long run. Experimenting and practicing are the only way you are going to be able to make those photographs exactly how you want them. The Aperture is how much light is let into the camera. Set your aperture to an f-stop value of at least F/11. The higher the f-stop value the smaller the aperture ( so less light let into the camera) and the greater the depth of field ( what is in focus on your image). For landscape photographs you will usually want as much of your image in focus as possible, so a higher f-stop number is ideal. If you want to get into all the gory tech detail here is a great article. Sometimes the beauty of a sunrise is the colors that come alive in the landscape. 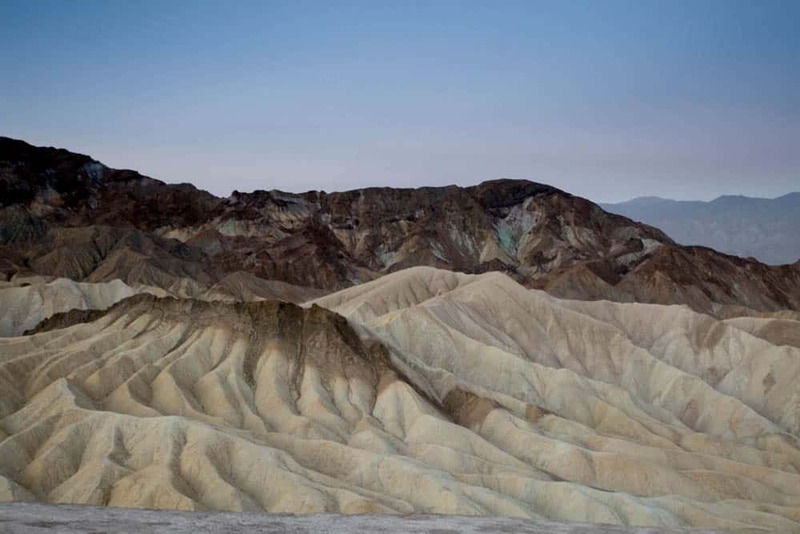 During the searing heat the variety of hues at Zabriskie Point in Death Valley, California disappear completely. Shutter Speed is how long light is let into the camera for. If you have your camera in Aperture Priority mode the camera will automatically set this for you. In Manual Mode then you will need to play with shutter speed until you get the correct exposure and effect you want. To compensate for the lower amount of light let into your camera due to natural light and aperture setting, the shutter speed will get slower ( under 1/60 which means 1/60th of a second). When the light is minimal you may be using shutter speeds up to 30 seconds. The sun can create high-contrast situations. Make sure you expose for this by pointing your camera at the brightest point in the area you want to capture to set the exposure. Also, bear in mind this will make the darker parts of your image even darker. 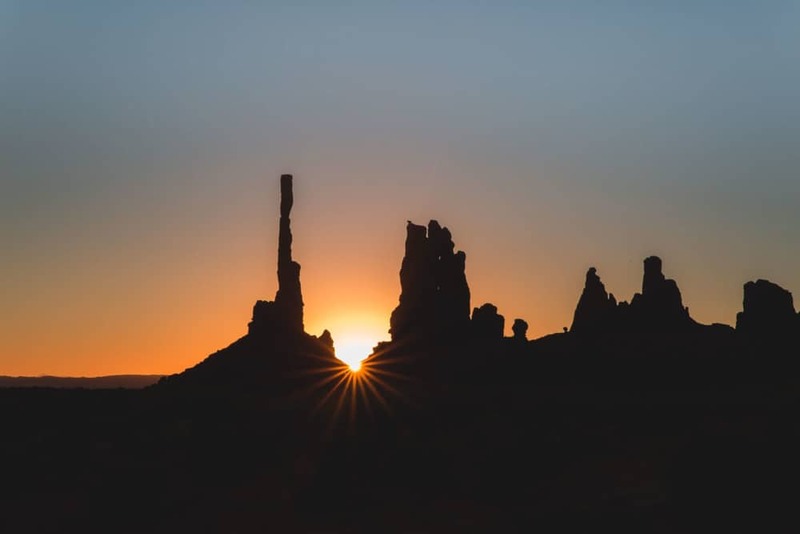 The light will be changing very quickly during sunrise and sunset so make sure you keep adjusting and checking your exposure. If you are using slow shutter speeds then you can still get camera shake with a tripod. To fix this you can use a shutter release. If you don’t have one, why not set the timer on your camera? This will allow a delay from you touching the camera to the image being taken. There are no right or wrong settings. The key is to experiment and create. You may want a dark and moody image so purposely underexpose your image..its all up to you. Start with a setting then play from there. 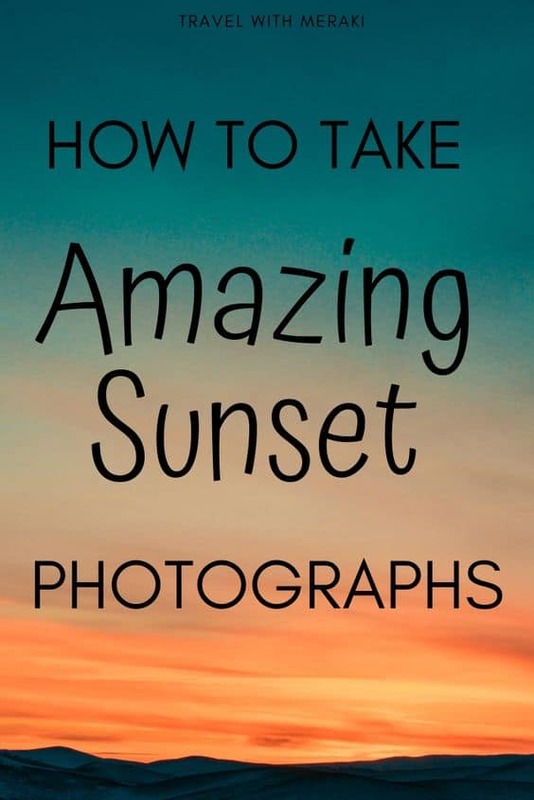 You may also find you will want slightly different camera settings for sunset photography and sunrise. Looking for the perfect gift for the photographer in your life? Check out our post: The Best Gifts for Photographers to Cover All Budgets. Making the perfect image can be a little daunting, especially if you are still working on the technical side of taking your image. Keep these simple things in mind though and remember the big picture. It’s all about enjoyment. Play with your images and experiment. The perfect thing about digital cameras is it’s so easy to take a quick look to see if your idea worked, delete it if not and move on to the next idea. Learn and create. Here are a few tips that you can experiment with to create amazing images. Look at the scene without the camera. What draws your eye first? Where are the interesting parts of the scene? What story would you like to share in your image? What would you like the person viewing your photograph feel? Imagine your frame is split into three, both vertically and horizontally. Now place spots of interest on those lines. Maybe you want to focus on the colors of the changing landscape rather than the sky. Place your horizon on the top third of the image. If it’s the sky you want to focus on, place the horizon on the line in the bottom third of the frame. A perfectly timed sail-boat magically appeared in your shot? Place it on one of the points to create interest. To help set a sense of scale as well as creating interest for your image you need to create layers. Have a foreground, mid-frame, and background. This creates a sense of depth to your images, making them real. Place interest in these areas. Maybe there’s a rock in the foreground that has the light reflecting off it? Or amazing shadows in the background. Work on making these part of how to take a sunrise photo. 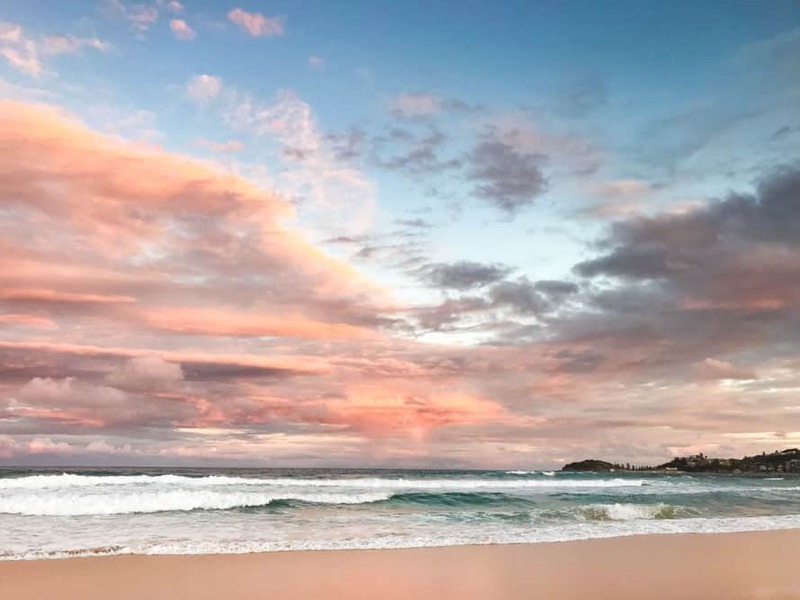 Click here for 5 easy tips to get your beach photographs looking amazing, from beach sunset photography tips to camera setting and more. 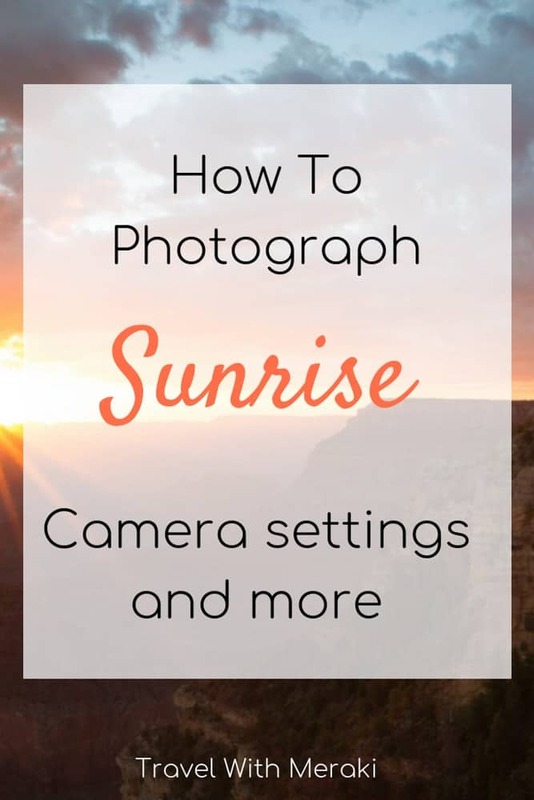 Don’t just point your camera at the sunrise or sunset. Have a look around. The colors and shadows created by the light can make for some great images that don’t have the actual sun in them. 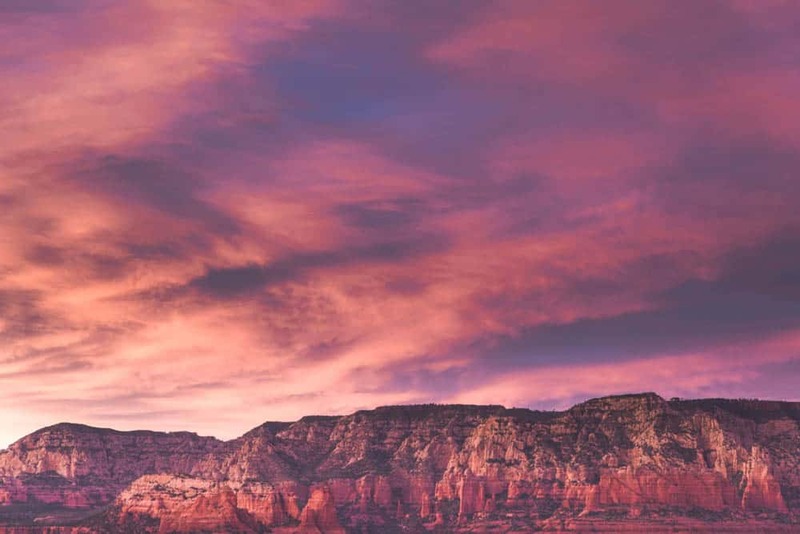 While capturing this sunset in Sedona, Arizona I was told by a stranger I was facing the wrong way. I’m pretty happy with what I captured though. To get a starburst effect use the widest lens you have and set your aperture to as high as you can. This is usually F/22. The higher that f-stop number the bigger the starburst. Cover the lens while you get your settings right. You can just shade it with your hand until you have them set then let that sun stream in. These make a great focal point in an image and add mood to your photograph. Silhouettes are very easy with sunrises and sunsets. Just place your subject or object between you and the camera, making sure the sun is behind them. Set your exposure based on the brightest part of your image, not on the part you want to be silhouetted. The best silhouettes are shapes that have little interest and are also very recognizable. There are some great samples and tips here. 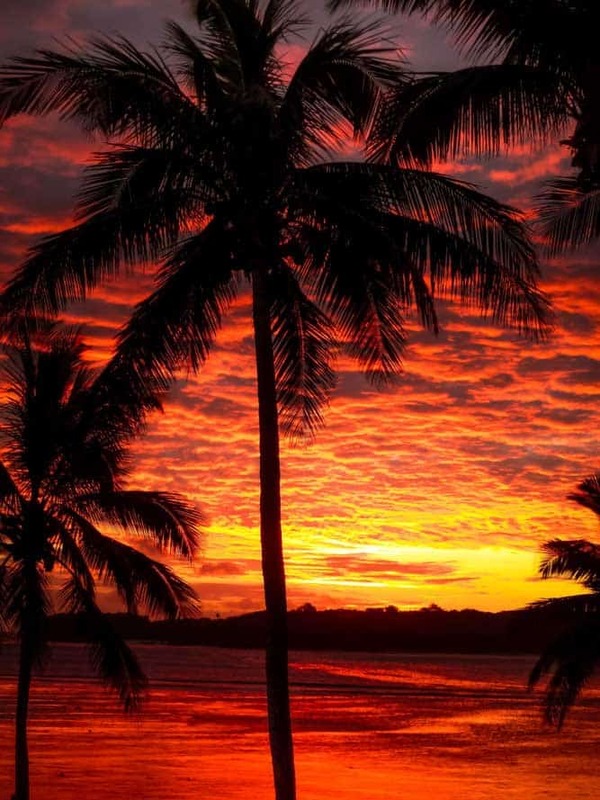 Palm Trees create beautiful silhouettes in Fiji. If are near moving water you might want to create the smooth silky effect with really slow shutter speed ( anything under 1/60). Or increase the shutter speed for a freeze effect. With such low light it is going to be a balancing act, so think about the effect you want and start balancing. To get that silky effect and the correct exposure you may need to decrease your aperture or increase your ISO. 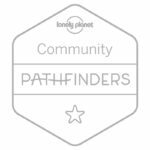 Discover the best cameras for family travel here. Don’t pack up to early. The light and colors change so quickly during sunrise and sunset. You can never be sure what will happen until the sun is deftly up or down. Photography is a skill. Keep experimenting. The more you practice and play the better your images are going to be. You will start to be able to predict how an image will look, and create the photographs you want. 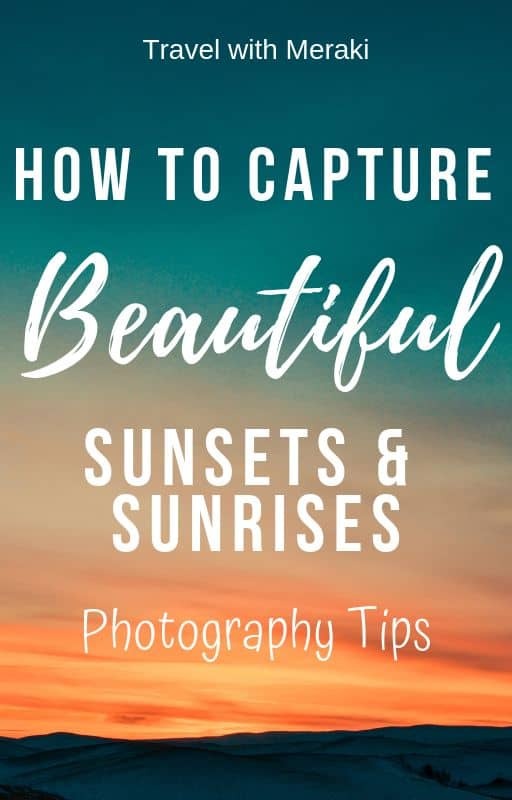 I hope this post has helped you get out and create some amazing images and giving you some tips on how to photograph sunsets and camera settings. Want to know what equipment and tools we use for all our photographs? 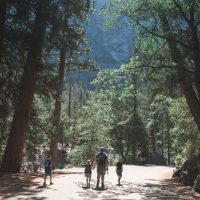 Want some great tips on Family Travel Photography? Head over to this post now. Or How to Photograph Children here. Find photography hacks to make you a better photographer. 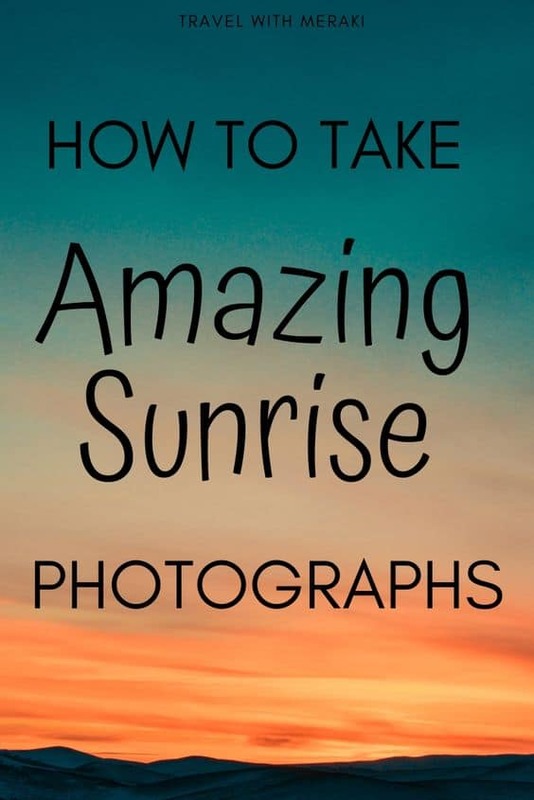 How to take amazing Sunrise and Sunset Photographs. Find out why photography is good for you.